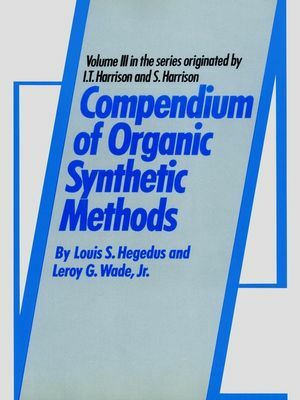 Louis S. Hegedus, Leroy G. Wade Jr.
Compendium of Organic Synthetic Methods, Vols. I & II By Ian T.Harrison & Shuyen Harrison Volume I A complete one-volumecompilation of organic functional group transformations. 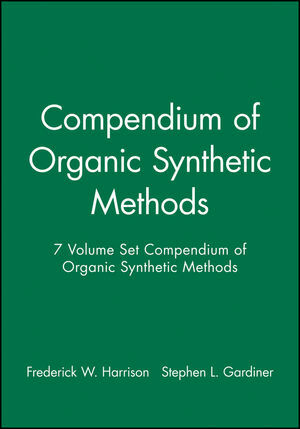 Includes3000 synthetic methods presented in the form of reactions withleading references. Divided into sections corresponding to allpossible interconversions between the major functional groups:acetylene, carboxylic acid, alcohol, aldehyde, etc. Other partsdeal with the protection of carboxylic acids, alcohols, aldehydes,aminos, and ketones. 1971 529 pp. Volume II Presents thepreparations for all monofunctional compounds published between1971 and 1974, plus findings of earlier years to provide a valuablesupplement to Volume I. 1974 437 pp. LOUIS S. HEGEDUS is Associate Professor of chemistry at Colorado State University. After receiving his Ph.D. in organic chemistry from Harvard University he served as a postdoctoral fellow at Stanford University. LEROY G. WADE, JR., received his Ph.D. from Harvard University in 1974, and is currently Assistant Professor of chemistry at Colorado State University. Interested both in synthetic methods and in chemical education, Professor Wade has published articles and books dealing with research, education, and reviews of the literature. Preparation of Alcohols and Phenols. Preparation of Alkyls, Methylenes, and Aryls. Preparation of Ethers and Epoxides. Preparation of Halides and Sulfonates.